Allows to jump while sprinting. Also you can configure jump height multiplier, how many times you can jump (double jump like in action games) and some other things. No ESP! Disable after X seconds option is now allowed to have decimal places. Added option in config to allow jump when sprinting. Doesn't actually make you jump faster, just allows. Possible to change jump height multiplier separately for all, second (or more) or sprint jump. Added option in config to require a perk. Set 0 to not require a perk. Added option in config to disable double jump after being in air for >= X seconds. Set 0 to disable this. No need to update if you don't want to use either of these options. 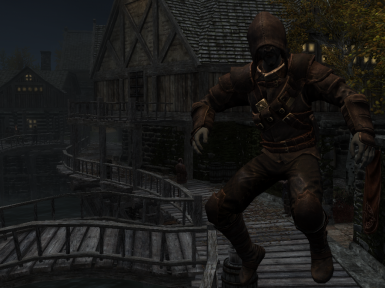 Allows sprint jumping, double jump, changing jump height multipliers (compatible with other mods that change jump height) and some other things. None of this works with horses. By default only sprint jump is enabled. It's SKSE plugin, no ESP. You can find a text file in "Data/SKSE/Plugins/DoubleJumpPlugin.txt" there you can configure how many times you can jump and all other settings. The plugin is named DoubleJumpPlugin because it started out as a mod to allow double jump but then I added stuff and everyone likes the other stuff more than double jump so I renamed mod to a more generic name.